Fishpond Wood is part of a once extensive network of pleasure gardens for the Yorke family of Bewerley Hall (demolished in 1925). 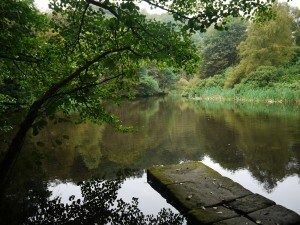 Fishpond Wood, along with Skrikes Wood and Ravengsill, reflect the ‘picturesque’ movement, which promoted gardens which appeared natural or even wild. The layout of the paths and the pond at Fishpond Wood took advantage of the rocky millstone grit outcrops and hillside location to sweep through this ancient and semi-natural woodland and along the water’s edge, before heading further uphill to Ravensgill and then Skrikes Wood where more dramatic outcrops and waterfalls could be seen. 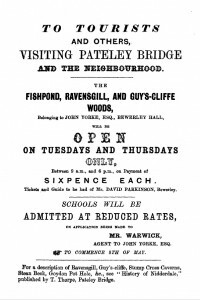 In the 19th century, Fishpond Wood, as with other Yorke gardens, were often open to public, for a small charge. Today, although privately owned, it remains open for the public to enjoy its peace and beautiful woodland walks. The pond was created by damming up a stream, however, we don’t know when this happened. It is possible that it has monastic origins and created as part of the fisheries of Fountains Abbey. Alternatively, it may have been created later by a member of the Yorke family. The pond contains a small island to the north, a jetty to the south and a boathouse to the southwest. Certainly the jetty and the boathouse are later features, belonging to the designed landscape, the boathouse being an addition made by John Yorke’s nephew, also John, in the early 19th century. Tucked away in the eastern corner of the woodland is an icehouse built in the late 18th century to serve Bewerley Hall with ice for preserving food, and for cool refreshments. It has a large domed brick chamber set deep underground, with a grille at its narrow base for draining the melt water. The brick chamber is connected by a stone tunnel that was built some years later by John Yorke’s nephew. It fell into disrepair following the demolition of Bewerley Hall in the 1920s. It is a rare example of an icehouse in Nidderdale; initial research suggests that Studley Royal is the only other example within the Nidderdale AONB where visitors are able to view the interior. The icehouse is now also home to one of Fishpond Wood’s rarer residents, the European cave spider: Meta menardi (identification and photograph: R. Burton).